Youth 11-17, get ready for the adventure of a lifetime! 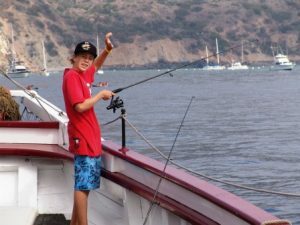 Los Angeles Maritime Institute’s summer camp aboard Tall Ships is an exciting 3-day or 5-day voyage to Catalina Island. Discover the beautiful Southern California coast in a way that most people never experience. 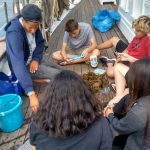 While at sea and on the island, we will explore topics in marine biology, maritime history, island ecology and have some fun with traditional Maritime arts! This is one of the most memorable summer camps in Southern California! Learn the ropes of sailing a large vessel as you challenge yourself with exciting new opportunities. We encourage our campers to become part of the crew as we set sail to and from Catalina Island. Make new friends, eat great food, listen to the sound of the sea, and gaze at the stars at night. Then hit the island for some unforgettable fun! 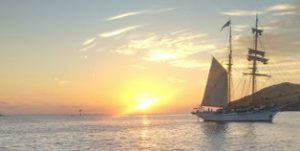 Our camps are offered aboard all of our vessels: the twin brigantines Irving Johnson and Exy Johnson, and new this year Los Angeles Maritime Institute has added the 140′ schooner American Pride to our fleet! Camp trips depart from Long Beach and San Pedro, California and visit one or more harbors off the coast of Catalina depending on weather and sea conditions. For more information or to book a spot for your child email us at info@lamitopsail.org or call our office at 310-833-6055. Parents- please supervise your child’s packing, all too often we have campers who have forgotten items that are necessary for their comfort and enjoyment. Please note! We do not provide bedding and you must bring your own. You must bring gear aboard in a soft Duffel or similar bag – hard luggage is unmanageable aboard a tall ship. Remember to clearly label your personal items!